Sledding - what to consider? 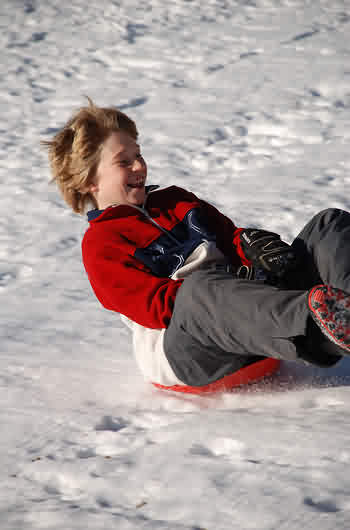 Sledding is considered a harmless, recreational fun, which can be done by almost everyone during winter. After all, all that is needed is a sled, warm clothing and, of course, a hill to fully enjoy this snowy fun. However, sledding is not as harmless as it seems to be at a first glance. Beginning with a few bruises, a fractured collarbone and even a prolonged stay in the hospital due to multiple fractures – we have it seen all with kids on the slopes. Here are a few tips on how you can minimize the danger and avoid a trip to the hospital. 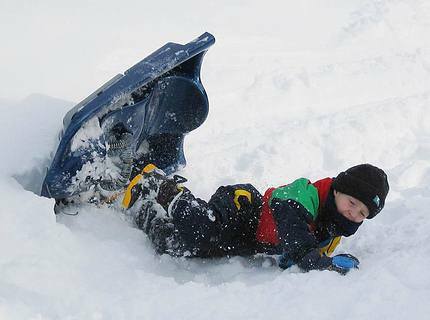 Sledding accidents are mostly due to carelessness and arrogance. Or, of course, because one didn’t stick to the rules. Also, it is not common practice to wear a helmet while sledding (unless you are on a specially prepared toboggan track). While there are more skiing and snowboarding accidents, toboggan accidents follow closely. These days, with modern sleighs and a well-prepared tracks it is possible to reach a speed of 50kmh and more; accidents are possible. Particularly while navigating or when braking. Away from slopes, in narrow forest paths it is tempting to engage in a speedy descent without calculating any possible obstacles. However, collisions with stationary objects and other people on the slope are not a rarity. In the worst case scenario, such a crash can lead to chest and head injuries. However, with careful preparation, planning and a watchful eye on the slopes and toboggan track sledding can be a harmless and carefree winter fun. What should participants be aware of? Prior to the first thrilling ride on the slopes, you have to take a critical look at the slope, the toboggan track, your equipment and last but not least your skills. You also should familiarize yourself with the basic rules on the slope. Above all though, safety always takes priority. 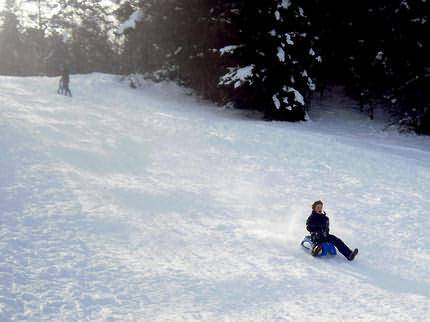 At the beginning of the winter, beginners, as well as experienced sledders, should choose a not to steep slope or toboggan track to start the season. 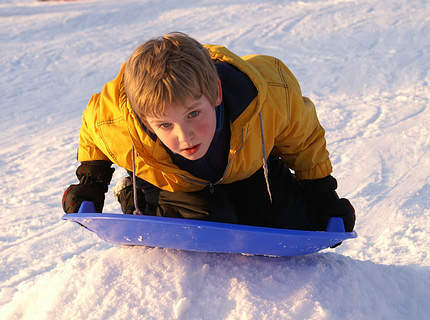 The reason is to get familiar with the equipment and get a feel for sledding once again. 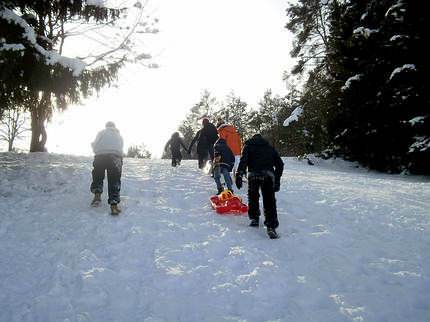 Before the participants hop on their sleighs, they are encouraged to check the track or slope critically for obstacles such as trees or fences. This way they can charter their track and allow for enough time and room to steer around those obstacles without being forced to quick and unexpected responses. Also, the toboggan track should be located at sufficient distances to places were unforeseen hikers or skiers can be encounter. Unfortunately, you can’t really escape this particular risk. Not even on designated toboggan tracks. A good idea would be, at least once walking down the track. Make sure you walk right at the edge, so you do not put yourself or other participants into harm’s way. The toboggan track should also be wide enough to allow the sledders to avoid collisions and to go past each other. That will greatly reduce the risk of accidents. By no means use pathways bordering parks, roads, bodies of water or are leading into a wall. Clothing should be warm and weatherproof. 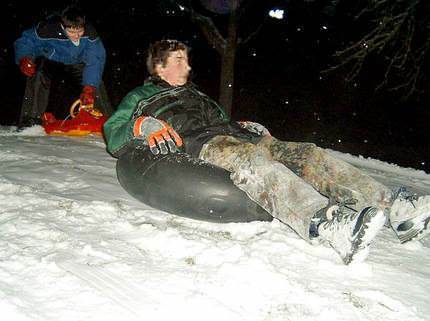 Pants and sweaters should not get wet when the sledders crash. Therefore, a combination of ski pants and anorak are recommended. Under no circumstances should the sledders go without gloves. If needed, they can reach into the snow to help braking or steering. Solid, high shoes with non-slip soles will prevent for snow to penetrate, but also to help with walking back up and braking. Important: The shaft should be high enough to cover the ankle, as this minimizes the risk of injuries to the ankle. For safety reasons, a helmet should be part of the equipment as it will help to prevent head injuries. Ski goggles and a headlamp round off the equipment. The goggles will ensure a clear view at any time. Even when it starts snowing or snow splashes in the kids’ faces during a speedy ride. The headlamp, on the other hand, is more for security on the way home. Nowadays plastic bobs and other “plastic supports” enjoy more and more popularity over the classic wooden sleigh. Mainly because they increase the speed. The downside, however, is, they are hard to steer and brake. Even with a “brake claw”. If you want to invest in a new sleigh, be sure to check for the TÜV seal or the GS mark for tested safety features. It is paramount that the user can steer and brake the slide smoothly. You can find all that out if you go for a test ride with a similar model. Those can be hired in almost every ski or sports shops which provide sports equipment. What is required of the sledders? We encourage for children’s sleighing only when they can safely steer and bring the sled to a halt. In no case should children under six years of age go sleighing on their own. For older children, it depends greatly on their experience and how responsible they are with the sleigh. Before departure, each sledder should thoroughly warm up. This increases the response time and reduces the risk of injury. The sledders must be seated facing the direction they are going. This will give the head more protection from injuries. All sledders should ride carefully and only at a pace so that they can brake the sleigh at any time. This is particularly true for places with poor visibility. Also, those are not places to wait for his friends or stop after a fall. If he wants to overtake someone, he needs to do so in places where he can give sufficient distance and/or call out to others to avoid a collision. In order not to violate their duty of care, adults need to keep children always within sight. This is particularly true until the parents can be sure that their children bring the appropriate safety and maturity to the event. If there is an accident, with a third party injury they may be found guilty of a breach of their duty of care. This is especially true when the children are younger than seven years. As a youth leader, you have to observe several rules, all of which result from the above points before you embark on the sledding trip with your youth group. Before you start with your rides agree with the young people that everyone walks back up on the same side. If you have to intervene, if necessary re-write the behaviour rules. On what to pay particular attention and where does the danger lurk? If there are too many kids on a sleigh, this could propose an obstacle for the next driver. Either keep plenty of distance; even better, wait until the “snow taxi” has reached the bottom of the slope. Plastic bags and tubes are particularly speedy but unable to steer. With the plastic bags, if there is an icy passage or stones sticking out of the ground, this can lead to severe injuries. If you engage in a rather long sleigh track, it is better to cover difficult or dangerous passages by foot. Especially if you do not know the track well.